ExoTiles is the only online tile shop which specialises in premium stainless steel, copper, glass, stone mosaic and sea shell. These non-traditional tile materials will become a unique, fashionable and modern feature to your home or office. From Newcastle NSW we deliver direct to your door anywhere in Australia (and also anywhere in the world if you contact us first). All ExoTiles tiles are hand made, each tile is placed one at a time. You will find our mosaic tiles are suitable for a range of wall applications including kitchen splashbacks, a feature wall or bathroom wall tiles. 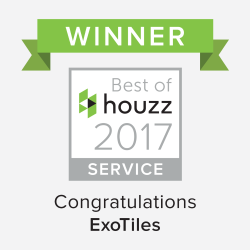 At ExoTiles, we believe that tiles can be a work of art. That's why we carry an impressive range of tiles created by expert artisans. If you've been looking for tiles for your home, you don't need to look any further. We have exactly what you need. When people picture tiles, they don't usually think of wood. However, wood can be an excellent material for mosaic tiles. Wood mosaic tiles have a unique look that can really make your home stand out. Wooden tiles won't be right for every room. Because wood can be damaged by water, you should avoid using wood tiles in your bathroom or as a backsplash. With that said, wood tiles can be stunning in an office, corridor, or another part of your home. It's common to see stainless steel appliances. However, stainless steel tiles aren't quite as common. Our stainless steel mosaic tiles have a ceramic base and stainless steel caping. We offer a wide range of stainless steel tiles, from subway tiles to lantern mosaic tiles. All of our tiles have a unique and distinctive look. If you're looking for affordable tiles to use for your kitchen splashback, you should definitely consider porcelain tiles. We recommend our porcelain tiles to our budget conscious customers. Even though these tiles have a lower price, they're still very well made. Glass is a popular material for mosaic tiles, and it's easy to see why. Our glass tiles are absolutely beautiful. They're a perfect fit for unique, intricate designs. We offer glass tiles in many different colors and styles. Whether you're searching for kitchen tiles or bathroom tiles, you'll find the tiles you want at ExoTiles! If you like the look of glass but are curious about your other options, you should look at our glass mix tiles. These tiles combine glass with metals like stainless steel. The visual contrast is extremely appealing. Stone tiles tend to be quite durable, which means that some stone tiles are suited to both indoor and outdoor use. Our stone tiles also come in many different styles. From marble tiles designed for the bathroom to bevelled stone tiles that mimic the look of timber, we carry a wide variety of tiles made from stone. Copper tiles are a dynamic choice for a kitchen splashback. We offer copper subway tiles, chevron mosaic tiles, and a number of other options. If you're worried about tarnish, you don't have to be. We recommend wiping down your copper tiles with olive oil from time to time. This will keep your tiles streak and tarnish-free! If you're interested in using natural, sustainable materials in your home, you should consider shell tiles. We carry beautiful tiles that are made from sea shells. These tiles are best suited for indoor applications. If you're interested in our tiles but aren't quite ready to make a purchase, get in touch with us. We'd be happy to post you samples of any of the tiles we have in stock. Although we do charge a small fee for these samples, we'll apply a credit to your account. Buying tiles online in Australia doesn't have to be a risky proposition. At ExoTiles, we'll make sure you have a safe, stress-free shopping experience. Whether you're based in a big city like Brisbane or Melbourne or a smaller town like Alice Springs, we believe that ExoTiles is the best place to buy tiles in all of Australia. As you can see, our selection is impressive. No matter what you're looking for, we should have the tiles that you need. We also pride ourselves on our customer service. We'll go above and beyond to help you get the tiles that you're looking for. Buying tiles online shouldn't be a hassle. Whether you're interested in buying swimming pool tiles or tiles for your kitchen, we'll make sure you get exactly what you need. If you want to learn more about what we have to offer, browse our site or get in touch with us. We'd be happy to answer your questions. We want to help you find the ideal tiles for your home! We have a larger range than what we list on our website, check out our facebook page and Google + to see a larger gallery of the huge amount of tile designs we have access to and keep up to date on any specials or competitions.